Albert Ellis’s ABC Model is a major part of his rational-emotive behavior therapy (REBT). REBT served as a sort of precursor to cognitive-behavioral therapy (CBT), and the ABC Model is now a treatment commonly used in CBT interventions. This article will cover what the ABC Model is, how it and REBT relate to CBT, and finally the ways in which the ABC Model works to target dysfunctional thoughts and beliefs. More Theory By Albert Ellis: What Is The ABC Model? CBT has its direct roots in Aaron Beck’s cognitive therapy (CT), which he developed when he decided that contemporary treatments for depression focused too much on past events rather than current beliefs (such as the belief that one is not good enough for their job or partner) (Beck, 2011). Beck’s CT has its own roots, though, and Albert Ellis’s REBT is one of those roots. Specifically, REBT is “the original form and one of the main pillars of cognitive-behavioral therapies (CBT). Alongside with the cognitive therapy (CT) created by Aaron Beck (1976), it served as the basis for the development of CBT” (David et al., 2018). In other words, REBT is both a precursor to and a form of CBT. The main things that set REBT and CBT apart from preceding cognitive therapies is that REBT and CBT both target beliefs as a fundamental course of treatment. 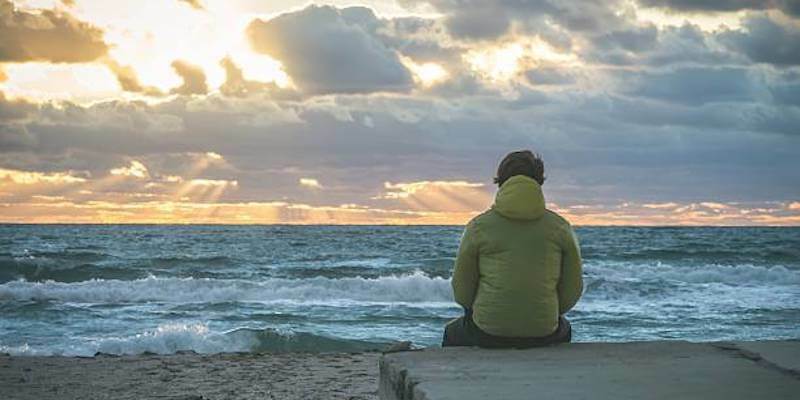 For the purposes of this article, we can consider REBT to be a subset of CBT, and we can consider the ABC Model to be an REBT treatment plan as well as a CBT treatment plan. The basic idea behind the ABC model is that “external events (A) do not cause emotions (C), but beliefs (B) and, in particular, irrational beliefs (IB) do” (Sarracino et al., 2017). Another way to think about it is that “our emotions and behaviours (C: Consequences) are not directly determined by life events (A: Activating Events), but rather by the way these events are cognitively processed and evaluated (B: Beliefs)” (Oltean et al., 2017). Furthermore, as evidenced by the first quote, REBT divides beliefs into “rational” and “irrational” beliefs. Ellis initially believed that REBT was incompatible with religiosity, or at least with “absolute” religiosity, though he has come to accept that certain types of religiosity are compatible with REBT (Ellis, 2000). Specifically, according to Ellis, belief in a “loving God” can lead to positive mental health outcomes, while belief in an “angry” God can lead to negative mental health outcomes. This is surely a bold claim but shows the evolution of Ellis’s thoughts on REBT and the ABC Model, particularly how they relate to religion. 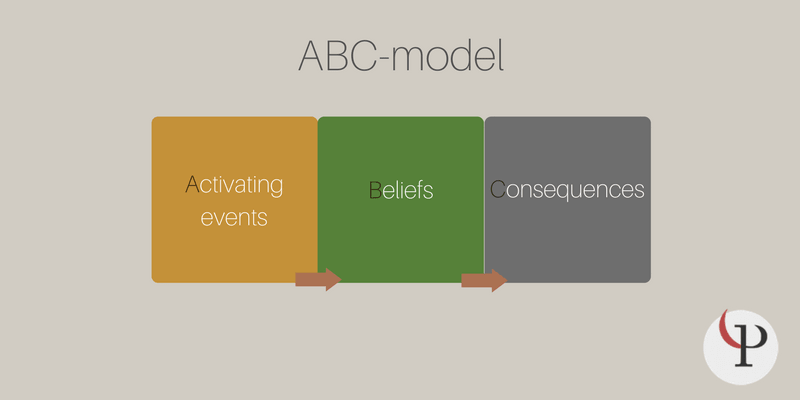 The ABC Model can also be referred to as the “ABCDE” Model, where D stands for the Disputation of Beliefs and E stands for New Effect, the result of holding healthier beliefs (Jorn, 2016). This is no different than the ABC Model in practice, because Disputation is a key part of the ABC Model (such as in the case of disputing an irrational belief to turn it into a rational belief), and New Effect is simply the result of that disputation. Calling it the “ABCDE” Model instead of the “ABC” Model simply makes these two steps more explicit, but they are present regardless of what one calls it. “a key element is helping clients see the connection between an event that may serve as a trigger, and how irrational evaluations may cause emotional and/or behavioral consequences that often in turn lead to increased distress or conflict” (Malkinson & Brask—Rustad, 2013). This is the main idea behind the ABC Model, as one does not necessarily have to change their environment, they simply have to recognize and change their reactions to their environment. This is indicated by the fact that three 45-minute learning sessions about the ABC Model have been shown to be effective in reducing symptoms of depression and anxiety as well as reducing dysfunctional thinking while increasing self-esteem and feelings of hope (Saelid & Nordahl, 2017). It is important to note that this was achieved in an experimental group where 18 of the 20 participants “reported not having had any previous knowledge of the links between thoughts, feelings, and behaviour”. Regardless, this indicates that the ABC Model partially works by showing people the connection between their beliefs and their emotions, and by showing people that the events around them do not necessarily dictate their emotions. The ABC Model has been successful in treating anger issues as well (Fuller et al., 2010). This treatment was especially promising because participants were able to deal with their anger while confronting potential anger triggers, rather than simply avoiding anger triggers. This underscores the idea that the ABC Model works by changing one’s beliefs in response to the environment around them, rather than changing the environment around them. In cases of unhealthy anger, and other instances of unhealthy negative emotions, the key difference is between rational and irrational beliefs (Ziegler & Smith, 2004). In certain situations, however, the ABC Model cannot be deployed as is. For example, treating someone who is grieving, such as someone in bereavement from losing a child, requires a modification. This is because in the case of grief, “‘logical’ disputation is not useful, but instead, legitimizing and normalizing is used: losing a child is in and by itself not logical” (Malkinson & Brask-Rustad, 2013). 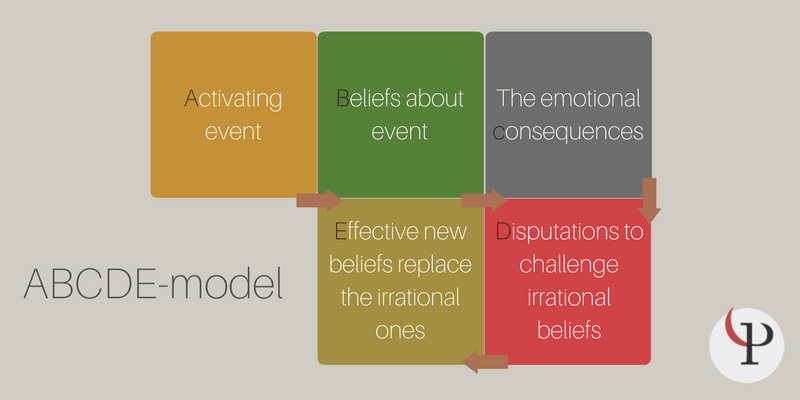 In general, the ABC Model works by turning irrational beliefs about activating events into rational beliefs, which in turn leads to better consequences and emotions. In some cases, however, such as grief, it is not about turning irrational beliefs into rational beliefs, but it is instead about “legitimizing and normalizing” the beliefs that are present. In most cases, though, the ABC Model targets irrational beliefs. This extremely short worksheet simply lists the five steps of the ABC model in descending order. It goes from Activating Event to Beliefs to Consequences to Disputations of beliefs to Effective new beliefs. This worksheet does not offer too much explanation but could be a good resource to hang in an office or classroom as a reminder to practice the ABC Model. This three-page worksheet, which appears to be part of a longer packet from a Dartmouth College, is a great stand-alone way to learn about the ABC Model. The worksheet clearly and briefly explains what the ABC Model is and how to use it effectively. This is a good option for someone looking to quickly learn about the ABC Model and how to use it in themselves. This worksheet serves as a prompt to help someone work through the ABC Model whenever they may need to. This would be another great resource to hang in a classroom or office as a reminder of the connection between beliefs and emotions. This worksheet is also useful because it does not require any prior knowledge about the ABC Model to use it successfully. This is similar to the above worksheet, as it also walks one through the ABC Model whenever one may need it. It may be more appropriate for adults, however, while the preceding worksheet may be more appropriate for younger people (simply because it is more colorful and prompts for fewer responses). This worksheet also works regardless of one’s prior knowledge of the ABC Model. This worksheet also walks one through the ABC Model but is targeted towards therapists to give to their clients. It is also slightly more visual than the other worksheets which walk one through the ABC Model, so it may be helpful for anyone who prefers visual methods, not just clients of therapists. By providing boxes instead of lines, this worksheet also allows one to draw rather than write, which may also be helpful for younger clients. The main takeaway from the ABC Model is that while environmental factors can certainly negatively affect our lives, we do have some control over how we react and respond to those factors. This does not mean that no harm can come to someone with a positive attitude, but it does indicate that a positive attitude can get someone through rough times, or help them better enjoy the good times. Having a positive attitude also does not cost anything, so it cannot hurt to try to keep a positive outlook. In the true spirit of positive psychology, we would all be better off if we remembered the principles of the ABC Model. In many situations, we may not be able to change the environmental factors (or Activating Events) that surround our daily lives. What we can do, though, is keep in mind the power of our own beliefs. Beck, J.S. (2011). Cognitive behavior therapy: Basics and beyond (2nd ed. ), New York, NY: The Guilford Press. Ziegler, D.J., Smith, P.N. (2004). Anger and the ABC model underlying Rational-Emotive Behavior Therapy. Psychological Reports, 94(3), 1009-1014. Hi Shelley, thanks for the feedback, I’m glad to hear the article will provide valuable reading material for your clients! THANK YOU VERY MUCH.BRIAN MUNDIA CHRESO UNIVERSITY 2020 EXIT ! Thank you very much. It’s helpful article for me. Very important to everyone. Thanks. Hello, Mr. Joaquin, I find your article very detailed and direct to the point that I can fully understand the model and the connection on the two therapies. Plus with the references and clean format of citations! Thank you for posting this.